Cheap but spirited Taiwanese kung fu film centred around the three Shaolin patriots Hung Hei-kwan (Li Chung-chien), Fong Sai-yuk (Meng Fei), and Luk Ah-chai (John Liu). 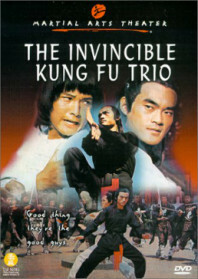 The film follows in the wake of Chang Cheh and Lau Kar-leung‘s seminal Shaolin series at Shaw Brothers. Like those films, this does its own myth-making, pitting the trio of rebels against a Pai Mei figure played by Kam Kong. The evil abbott is shown to be a master of the internal wu tang systems. He sleeps in a cave, tears off the face of one of his lackeys (just for the hell of it), and is shown to have close ties to the government. His butterfly style screws up Hung Hei-kwan pretty bad, so Fung Sai-yuk takes him to Uncle Fong’s hideaway to recuperate, where Angela Mao drops in for an all-too-brief supporting role as Hung’s fleeting love interest, Yim Wing Chun. In a fun twist, it’s revealed that the white-brow monk has been harbouring kung fu clones of the titular trio, so we get to see John Liu booting a version of himself in the head during the final act. Frustratingly, this doesn’t quite maximise on the potential of its strong cast, although at least Kam Kong does appear to be having great fun playing kung fu cinema’s most iconic baddie. AKA: Bruce and the Invincible Trio; Dragon’s Fatal Fist.